Dr. Norman Bergrun is an alumnus of Ames Research Laboratory, NACA (National Advisory Committee for Aeronautics) predecessor of Ames Research Center, NASA where he worked twelve years as a research scientist. At Ames, he pioneered the setting of design criteria for airplane thermal ice-prevention and the developing of roll stability laws for airplanes, missiles and rockets. An Associate Fellow of the American Institute of Aeronautics and Astronauics (AIAA), he is active as a leader in Congressional Visits Day events on Capitol Hill. As Deputy Director-at-Large for the AIAA western region, he overlooks section activities in seven western states. Other memberships include The Planetary Society, The Association for the Advancement of Science, The Aviation Hall of Fame, the National Society of Professional Engineers, the Federation of American Scientists and the Scientific Faculty, International Biographical Centre, Cambridge, England. Bergrun holds a BSME degree from Cornell University, an LLB from LaSalle University Extension, a DSc (Hon) from World University and a California Professional Engineer (PE) License. He also has engaged in graduate aerospace studies at Stanford University. He is a founder of the California Society of Professional Engineers Education Foundation, is author of two books Tomorrow’s Technology Today and Ringmakers of Saturn and has published over 100 papers. Two recent manuscripts, Lunar Life Forms: Revelations of Apollo 14 and Mars Puts on a Good Face: The Masquerade, have been registered with the Library of Congress, Washington, D. C. He has lectured in the United States, Canada, England and Europe. Ring Makers of Saturn Testimonial written by James Horak. “To see what is in front of us for what it is, when constrainment, both professional and alternative, abide no tolerance for close examination, requires the very rare virtues of Galileo Galilee, the courage of Lewis and Clark, the devotion to science of Copernicus. When a thing echoes convention and, at least, follows traces of already acquired perceptions little risk is taken to point out discovery. But when no ground is laid, when the slightest ramification seems beyond all matter of known manifestation…purpose, mechanism, ultimate extents are all outside the wildest of imaginations… then the very dynamics of true observation require the grandest virtues. And demand some of the deepest felt of sacrifice, sadly. Dr. Norman Bergrun elegantly qualifies, making the most astounding and significant of discoveries on a scale no man before him has witnessed. He has brought forth new thresholds upon which man must confront literally every equation upon which all the assumptions of an organic Universe have been made and sustained unto the present. The relationship of the EMVs to the “finishing points” of unfinished rings about Saturn suggested dynamics no one ever thought possible. Dr. Bergrun expressed these potentials, allowing significance where lesser men would falter. Knowing full well how these would fly in the face of convention, even cosmology, favored as well by religions as by science. Norman Bergrun’s “The Ringmakers of Saturn” is the inspiration for this video of the mysterious rings of Saturn. The big 3 amigo’s on ATS (mikesingh, zorgon, and internos) have each added enormous effort of personal research on this subject, by gathering up to date Cassini satellite imagery that is showing some very interesting anomalies on and around the ringed planet. Extract from The Ring Makers of Saturn by Dr. Norman Bergrun. Q: It is highly significant if that illumination comprising the unfinished portion of the ring is an enhancement or not. I am very eager to know. A: The preferred definition of “enhance” according to the Merriam Webster Deluxe 1998 dictionary is: to increase or improve in value, quality or desirability or attractiveness. Figure 3, by increasing brightness and contrast, unexpectedly brought out a latent image (the blue). Increasing brightness scarcely qualifies as enhancement within the sense of the definition. Figure 3 says something is present below the termination of the upper ring system. The approach taken was to brighten the entire ring system using figure 2 as the working medium; and this procedure resulted in producing figure 4. Figure 4 qualifies as an enhanced image within the sense of the definition. Q: What I’m concerned about is, is that area where the ring is incomplete, “extended” by enhanced brightness applied to the rest of the ring, or does it naturally possess an energy field that is visual? Presumably laid down, perhaps even prior to the addition of matter to the ring? This would indicate the presence of an incredible energy field extending perhaps through the entire ring. Perhaps, even entirely independent of any gravitational influence and aside from the planet. The next question would be, why they would not utilize gravity to conserve energy and complete the ring faster. This particular ring may be different than the rest. A: The extended ring has sufficient illumination in order for the camera to have recorded its image. The extended field is not an extension caused by increasing exposure. You can not create something that is not already there in the first place. To make the arc seen, were it not really there, means that the arc would have to be painted in. I did not do that. My interpretation of the extended ring is that it owes to emissions from the objects (Electro-Magnetic Vehicles (EMVs)) which are present there. That this energy field extends through the entire ring is speculation and certainly not evident from the data. With respect to using gravity assist, this is all factored in or else the EMVs would not be positioned where they are found. The presence of the EMVs, indeed, does make this particular ring system uniquely different. This system contrasts with the “well-behaved” ones commonly seen, which I categorize as “classical”. JCH: Q: When lightened, in the clip to the right, the unfinished ring in your Figure 4 has an illumination, like a phantom effect in Kirilian photography. I wanted to determine that this was not enhanced in any way upon the originals for the purpose of posing the presumption of what the “finished” ring might project. A: There was no enhancement . . . all procedures is indicated in the introductory material about the four figures. Nothing was presumed “before-the-fact” in order to obtain anything shown. It is interesting, however, that you should mention Kirilian photography. Kirilian photography is a process in which an image is obtained by application of a high-frequency electric field to an object so that it radiates a characteristic pattern of luminescence that is recorded on film or other medium. Your observation is supportive of my answer to your second question, namely, that EMVs are present and causing an electric field. DUAL QUESTION: “Why not simply let an orbital configuration exist to hold the matter in place as you go along, and why extend the field so far ahead of your work”?. ANS. TO FIRST QUE: Ringmakers Of Saturn Plates 5 and 6 and Figures 3 and 4 depict numerous emissions. For every emission there is a corresponding reactionary force. There is a “vectorial summary force” or more properly, a “resultant vectorial force” in each of the three physical dimensions (longitudinally, laterally, and elevationally) which can be considered to operate in each of the three planes. The size and direction of these three resultant forces are what keep the source positioned. “Trim” of these large forces is continually needed. The emitted ring itself has properties to keep it located also . . . to hold the matter in place . . . after all, the exhaust matter is still (electrically) connected to the source. Under such circumstances, nothing more is needed as the whole thing is a “shaped” magnetic field. ANS. TO SECOND QUE: Based on the answer to the first question, extending energy forward (into the tip or elliptical area) owes to the requirement of force management, particularly that of trim, hereto mentioned. Elaborating further, the MANAGEMENT of so many forces implies some very high-level “smarts”, i.e., intelligence. I infer from the foregoing deductions that the “intelligence thinking” is this: “We have so much energy at our disposal, we don’t have to use it efficiently. A corollary thought is: “If we run low, we always can get to a large fuel supply”. Earthly humankind has a problem in creating high specific impulse (Isp) fuels (high Isp means high energy per unit measure). So humans are constrained in their thinking to HAVING to use fuel efficiently. This constraint certainly does not apply to the intelligence possessing the high Isp matter as inferred from the presence of a fire ball larger than Earth’s moon! IMPLIED QUESTIONS: Is the completed ellipse (figures 3 and 4) another kind of containment to hold chunks of matter in a ring? ANS: First off, I don’t see “chunks of matter” in the completed ellipse . . . it looks more like gaseous plasma. Ringmakers Of Saturn Plates 5 and 6 never revealed evidence of a completed ellipse. So my interpretation is this: The “ring-completion” effect has to do with the force balance. Therefore, it may or may not appear . . . it probably can be pulsed or “tuned” as required or desired. Q: Are there other characteristics in this unfinished ring relatively unique to it that you have noticed? 1. No. The unfinished ring is, indeed, real as opposed to allegations to the contrary. 2. That different colors exist between the upper part of the ring system and the tip (Imaging definitely is clean and clear in the entire vicinity . . . see Figure 3), demonstrates a clear discontinuity in the nature of the ring structure. A discontinuity is a clear signal that an “input” is available, otherwise the discontinuity would not be there. Further, the difference in color of the upper part of the ring system as contrasted with the elliptical area can be construed as different matter, or a different state of matter, being present. My interpretation is directed to the inception of the rings. The rings are inevitable owing to an energy source spewing “exhaust” energy (like an airplane engine spewing energy, seen as a contrail when the temperature is sufficiently low). Another way to look at the situation is: The rings are a result of something causing them. Therefore, the rings are not intentionally “constructed”. The appearance of rings is a secondary phenomena, similar to an airplane-engine “con trail” being secondary phenomena to an airplane. The intent of an airplane-engine is not “con-trail construction”. The contrail is simply an inevitable by-product of engine operation. Ringmakers of Saturn Plates 5 and 6 caused me to realize early on that the width of the A-ring is at the most no wider than the lengths of the objects in the ring. Further, the A-ring does not have a “classical” full width. That part of the A-ring is missing radially provides the clue where the rings (what there are of them) are coming from . . . namely the objects. Upon realization that ring width correlates with object length, I raised this question: “If the inner part of the A ring is made this way, what about the outer part”? Ringmakers of Saturn Plates 7 and 8 are two examples of objects in the outer A ring with ring trails. This is where I rested my case. Dr. Bergrun: COMMENT ON “SUSTAIN A LIVING ENVIRONMENT”: My position on “living environment” in space is yes, there is life in space . 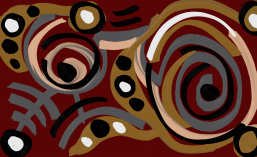 . . organic biota, albeit different from that with which human kind is acquainted. I can not tell from Ringmakers of Saturn Plates 5 and 6, or from Figures 3 and 4 whether or not the Saturn Voyager 1 ring tips indeed contain biota. The concept of a “nursery” goes beyond the pictorial data. USE OF ENERGY: Statement and Question. Were the area of the ring laid down before matter was added as an energy field (whose connection this represents), the question is why use energy in this fashion? A: A hypothetical question is posed here as indicated by the use of the word “were”. Nevertheless, in this assumed situation, it is difficult for me to see how one could “lay down an area”. Hypothetically, let’s give an order to “lay me down an area” . . . “I want to fill it”. My interpretation is that laying down an area (here my meaning is laying down ” boundaries” to define an area) and filling it with matter is not how the objects work. Ring shape (width) basically is controlled when the matter emerges from the objects, as heretofore discussed. Ring thickness is also governed by body geometry . . . specifically its diameter. The rings are thick near the source and become thinner the farther away the emissions are from the source. This is why researchers over the years have arrived at such a variety of values for ring thickness . . . the value depends not only on where you look, but also when you look. 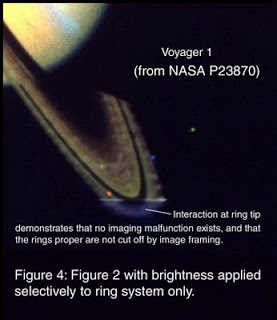 What Ringmakers of Saturn Plates 5 and 6 and P23870 Figures 3 and 4 show is at least one way to cause a ring to appear. This “one way” does not preclude existence of other ways.